Is Russell 2000 overvalued? This is the question that we answer in the last six articles. 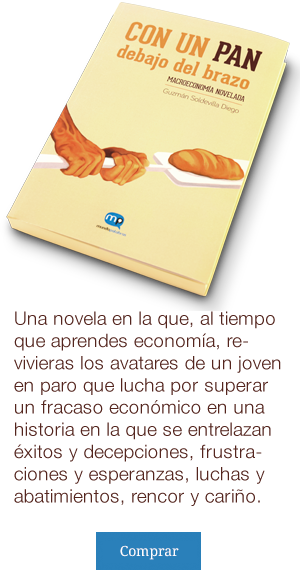 In this publication we put them all together trying to provide a more completed view of the issue to the readers. In most cases, nobody is surprised to hear that American equity markets are, if not overvalued, at least more expensive than many other markets. However, Russell 2000 is possibly the clearest example of this. It is one of the main American stock exchange indexes, composed of 2000 small caps that have the distinguishing feature of having trailing 12 months P/E ratio of 130.5x and 120.3x after cyclical adjustments. It seems to be a very good opportunity to be short, or at least to keep in mind in the case market tendency changes. Our trading algorithm has given already a signal to take a short position in Russell 2000. We will now try to analyse the fundamentals of its valuation in more detail in this article, and in the following ones. Valuing Russell 2000 by discount of dividends. Where the dividend is expressed by and we consider every kind of shareholder remuneration including share buybacks as dividends. Estimation of the American GDP for 2018. 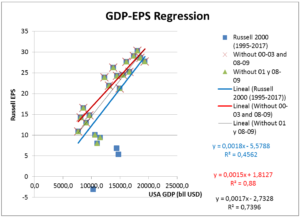 Estimation of the Russell 2000 EPS for 2018 using the historical correlation between Russell 2000 EPS and the American GDP. Estimation of dividend starting with the EPS and using the historical Payout ratio. Nine years after the market bottom in March 2009, we are pretty sure that the economic stage could be somewhere between the last third and last quarter of the cycle. Certain information makes us think this, such as the employment rate in the USA dropping near to the lowest that it has been for fifty years, the output Gap already being in positive levels, the inflation evolutions that have moved from below zero at the beginning of 2016 to 2.1% currently, and the interest rates of 1.75% in the USA after six upward movements, five of them in little more than one year. The economic evolutions in the near future in the USA will definitely depend on the Fed’s ability to establish the correct interest rate levels. The monetary authorities have to avoid two abysms: first, the rise in inflation and creation (or increasing) of speculative bubbles, and secondly an excess of conservatism that could cause the economy to slow down, and therefore cause the beginning of a recession. Almost everyone knows how difficult this task is and the long time that the economy takes to react to the stimulus, making it even harder and riskier. To a certain degree, it is a game of trial and error. Sometimes the error can be corrected and sometimes it cannot. In this sense, the FED can be compared to a funambulist – he can do it better or worse, but no one should expect him to walk the tightrope indefinitely. He has already walked in the abysm for 9 years, which is a significant duration, considering that economic cycles are on average 9.2 years long. For all of these reasons, we have decided to only discount the dividends for 2018, not only for Russell 2000, but for all the indexes that are under the valuation scope of our trading algorithm. But as we will see after, in Russell 2000’s case, the conclusion would not change significantly considering a longer term for estimations. 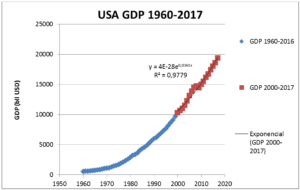 The USA’s GDP evolution can be approximated to an exponential growth with the following equation: e^(-63+0.0361*Year). This estimation is quite precise, particularly in the medium term, which is implicit in the R² ratio of 0.98x (Chart 1). Our estimation for the USA’s GDP for 2018 is 20.230 bn USD, which supposes a nominal increase of 4.5% compared with 2017. The standard error of the estimation is 390 bn USD. The correlation between and the USA’s GDP is also good if the recessional years are excluded. The reason for this elimination is that during the low periods, a significant number of companies incurred extraordinary losses and impairments that are not only a consequence of the state of the economy of the current year, but also the failure of longer term investments. During these periods, the correlation of the two magnitudes breaks down, and it reverts to high levels when the economy returns to a long term growth tendency. But as Chart 2 shows, the main difference between including recessional years or excluding them is not in the base estimation of the diverse models, which are very similar. The variation is more in the standard deviation, and therefore the precision of the predictions. Based on the EPS dates since 1995, a three line regression with the USA’s GDP is represented. Option a) considering dates from 1995 to 2017 without exceptions, b) the same period but excluding 2001, 2008 and 2009 and c) excluding the period between 2000-2003 and 2008-2009. As Chart 3 shows, the difference is more in the R² ratio than in the central estimation of the regression models. We have adopted Option B but as we can see, the difference between the other options is negligent. dates above 100% that we consider unsustainable in the long term. Proceeding in this direction, we avoid forgetting other remuneration to the shareholders apart from dividends. Despite the aforementioned lack of information, 72.33% is high enough to leave little room for erroneous estimation, considering that this Pay Out ratio implied a long term growth of 3.6% and ROE of 14.05%, which is significantly above the historical data. In addition, the Pay Out is calculated by dividing the aggregated dividends by aggregated EPS, and only companies with positive EPS would contribute to the numerator, but the denominator is the EPS of companies with profits subtracted from the EPS of companies with losses which are 30% of the index. In this sense, the Pay Out is expected to be higher than the average of the Pay Out of the index members. The growth of the dividends is expressed by g. It depends on the evolution of the EPS and the Pay Out ratio. As we have already explained, the Pay Out ratio has very little space to grow when it is already discounting a ROE of 14.05%, clearly above 8.17% that is the maximum since 1995 for Russell 2000. So all potential growth is expected to come from EPS. The growth in EPS is very correlated with the growth of GDP in the long term (See Chart 5). 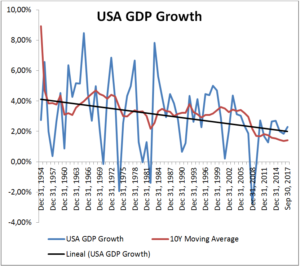 In the last 23 years, the growth of GDP in the USA has averaged 4.11% compared with 4.16% of EPS. In order to estimate future growth, we have make the assumption that it will be more or less in line with the growth of the regression based on the period between 2000 -2017. The valuation model is very sensitive to this factor, and because of that we will do one thousand simulations taking g values centered in 3.68% with a standard deviation of 0.55%. As we can see in Chart 6 below, all the different historic growth from the year 2000 for GDP is a little further away from central expected growth by one standard deviation. In this sense, many of the possible errors in this parameter are already considered in the valuation model. Cost of equity = Risk free rate of return + Beta × (market rate of return – risk free rate of return). The Risk free rate of return can be estimated by adding the expected inflation rate to the real risk free rate of return. 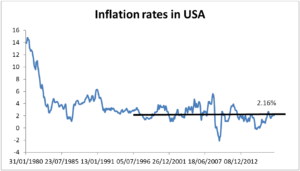 We estimate the inflation in line with the Federal Reserve objective. As Chart 7 shows below, it is not far from the historic tendency that has been 2.16% in the last twenty years. Our trading algorithm considers inflation rates centered on 2% with a standard deviation of 0.1%. Below, Chart 8 shows the historical evolution of the 10 Year USD Bond. 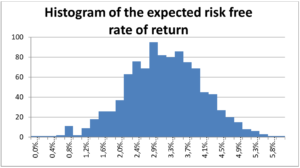 Chart 9 also shows the histogram of the values of the expected risk free rate of return that our trading algorithm takes into account in order to calculate the value of Russell 2000, and also the asset allocation. 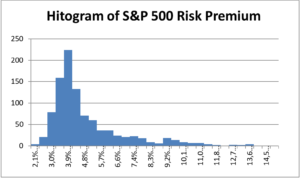 Risk Premium = expected market rate of return – expected risk free rate of return. Historical market return of S&P500 compared with the risk free rate of return. 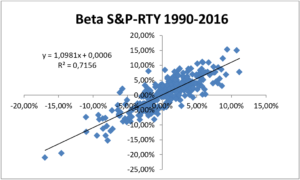 Historic average of return of S&P500 –return of 10Yr Treasury Bond 1966- 2017 · Using geometric averages as an alternative to arithmetic, the results would be 3.3% instead of 4.2%. Expected market return and risk free Dividend/Price + g dividend – risk free rate · Future growth evolution in line with the tendency growth of GDP 2000 – 2017. · Growth g = 3,6%, 1.6% in real terms plus 2% inflation. Base of PE Expected E/P – risk free rate · Dates 2007-2017 · This method is commonly used by investors but it is not correct from academic point of view. It identifies the return to shareholder with the inverse of PE which is not correct. Although to mention it here as a reference or expectation does not consider it. · The average value of the last decade is 3.3% that is close to the values calculated by other methods. Taking the former cosiderations into account,our expectation for risk premium is 3.9% with a standard deviation of 2.1%. How much is Russell 2000 overvalued? 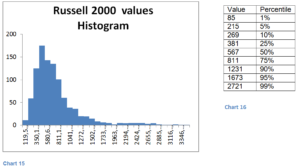 Below we can see the histogram of the values obtained for Russell 2000, making 1000 iterations. This has been done using random values for the described variables, centered on our main expectations and forcing the random iterations to follow the standard deviations of different variables. On the right, you can see a table with the values and their respective percentiles. On the 5th of March, 2018 the Russell 2000 index quotation was 1532. According to our calculations, the fair value of Russell 2000 is below the current prices with a probability of 94% and below 567 points with a probability of 50%. So why is not Russell 2000 overvalued for some investors? Trump’s tax reform that benefit small companies the most, as they are more exposed to the domestic market than the large caps. Infrastructure public investments could also benefit the small caps the most. Anti-trade policies that could give subsidies to non-competitive companies, and small caps would be one of the main beneficiaries. The financial sector makes up about 20% of Russell 2000. The higher long interest rates and more flexible regulation, could allow companies in this sector to take off. Trump’s tax reform will most probably move growth from the long to the short term. The law cuts corporate tax rates permanently, and individual tax rates temporarily which are expected to expire after 2025. The amount of tax reduction will be $1.46 trillion, and the impact on GDP growth expectation varies depending on calculations, but goes from 0.8% in ten years according to the Joint Committee on Taxation to 0.7% annually calculated by the Treasury’s Office of Tax Policy. The amount of public debt increase also fluctuates, depending on the source of calculation, and goes from $300 billion decrease to an increase of 2.2 trillion. Chart 16 summarises the results of the calculations for different organisms. 1.46 trillion USD Treasury’s Office of Tax Policy (OTP). The Treasury expects an 0.7% increase in growth from 2.2% to 2.9%. It has modeled the positive revenue impact of higher growth effects, using the Administration projections of approximately a 2.9% real GDP growth rate over 10 years, contained in the Administration’s Fiscal Year 2018 budget. $300 billion decrease in debt. JCT estimates that this proposal would increase the level of output (as measured by the Gross Domestic Product) by about 0.8 percent on average throughout the 10- year budget window $1.0 trillion. Increase GDP by 2.86 percent over the current baseline forecasts, or an average of 0.29 percent per year. $0.45 trillion. Infrastructure public investments could benefit the small caps the most, but only in the short and medium term. The plan consists of $200 billion federal funding for infrastructure investments over a decade, mostly for incentive states, localities and the private sector to find another $1.3 trillion to complete the investment programme. It also includes a streamlined environmental review process, which in the past has added years to the completion time for infrastructure projects. Public funds as a combination of federal, state and municipality funds. In the short term, the domestic economy will benefit, and therefore the small caps will be in a better position than the large caps. Between them, the ones operating in the infrastructure sector or activities related with it, will most likely get the better part. But in the longer term, the public debt will have to be repaid by increasing taxes, that will suppose a burden for the domestic economy. Internal savings. In this case there is only one way to do it and this is by reducing other public or private investments in order to have funds to finance the infrastructure investment. Theoretically, there is another method to achieve this purpose, by incrementing internal savings by reducing the consumption. In any case, if the programme has to be financed by internal savings, it will reduce investments or consumption and so the net impact in domestic economy will be negligible. Explanation of the operation of a large open economy: Una gran economía abierta y sus implicaciones en política económica. Explanation of a tax reform in a small open economy: ¿Bajar impuestos para estimular la economía? Depende. ¿Sabes por qué? In addition there is another risk in the longer term. The programme supposes almost 8% of the annual national GPD, and with such an amount, expansion to production capacity will most likely be the result in the sectors involved in the investment plan. After the infrastructure investment is finished, there could be a risk of generating overcapacity with the withdrawal of aid. But being realistic, I do not expect this threat to be a great concern for the financial market, as it is very much a long term risk. Anti-trade policies could provide subsidies to non competitive companies and small caps, and these would be the main beneficiaries. At the beginning of March 2018, Trump announced a 25 percent tariff on steel and a 10 percent tariff on aluminum imports. One week later, he signed an order to make the tariffs effective after 15 days. Canada and Mexico will be exempt from the levy, and he left the door open for other countries that will have to be studied case by case. But the exemptions for Canada and Mexico are not permanent. They depend on renegotiating NAFTA to Trump’s liking. If the protective policy ended here, the issue would not be at all relevant. However, this could suppose the beginning of a wider protection programme, extending to other sectors. Obviously steel, aluminum and any other sector (small caps between them) that could be affected in the future will benefit, but this will be offset by the increase in cost and reduction of competitiveness of companies that use these protected materials. Finally, the entire domestic economy will be negatively affected. Tariffs reduce the incentives of improving competitiveness. In fact, they are a subsidy financed by consumers to sectors that are not able to be competitive in an open market with foreign operators. It is a very dangerous zero-sum game. It could provoke similar measures of other countries, increasing the risk of a disintegration of international trade, with disastrous consequences to the global economy. We do not expect any positive consequences of the recent protective policy either in the short or long term. But neither do we expect significant negative implication. According to Trump’s declarations, until now, it seems just to be a signal to some countries like China that permit some of their companies to practice damping and other types of unfair trade. If we are wrong and it could suppose the beginning a broader protective policy it would be enough to expect the beginning of a recession period. 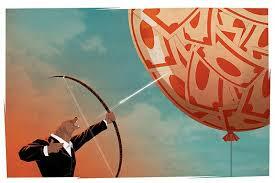 The higher long interest rates and more flexible regulations could allow the financial sector to take off. Considering that the financial sector makes up 20% of Russell 2000, and even in the hypothetical case of an increase of 100% in EPS of companies of this sector, the PE of the index would only improve to 104x, that is still extremely high. Russell 2000 overvalued almost in every considerable scenario. Increase of 1.2% growth (up to 2.9% in real terms) from year 2018 and the terminal growth at the same level, in line with the Treasury’s Office of Tax Policy expectation. The increase of 1.2% is divided in 0.7% increase because of the tax reform and 0.5% because of the impact of infrastructure investment using a very optimistic fiscal multiplier of 0.7x . 783 · Long term economical tendency growth at 2.9% is even much higher than the last two decades’ average (2.3%). It is against the historic tendency as Chart 17 shows, and it is unlikely that demographic issues that were not an impediment in the past are taken into account. · The growth tendency is one of the most aggressive if we compare it with other estimations like those of Federal Reserves or the Tax Foundation’s ones. · Even if the economic growth for the next decade could be stimulated, reaching a level of around 3% in real terms, there is no reason to increase our baseline estimation for long term tendency above 1.7% in real terms, after 2027. · Only in the most optimistic case expected by Treasury’s Office of Tax Policy that considers no public debt increase after the fiscal stimulus, could no reduction in economic growth be considered after the stimulus period. On the other hand, if according to the Joint Committee on Taxation the public debt will increase by $1.0 trillion in 10 years, the economic growth during the second decade could be reduced by 0.6% below the tendency (according to our calculations) if Government has to relieve the mentioned debt burden in the next 10 years from 2027. · 0.7% impact of Tax reform is also one of the most optimistic estimations if we compare it with the estimation of Joint Committee on Taxation of 0.8% throughout the ten year period, or 0.29% annually projected by Tax Foundation. · The infrastructure investment plan is expected to end in 2027, so there is no reason to expect fiscal stimulus beyond that year. In this sense, terminal growth should be below 2.9%, or the average growth of the period between 2018-2027. · Terminal growth at 2.9% in real terms, in line with Treasury’s Office of Tax Policy expectation. · Small caps growing annually 1% above the economy over 10 Years. 872 · Even though the small caps could benefit the tax reform more than the large caps, we think a long term growth above the USA economy will be very unprovable. 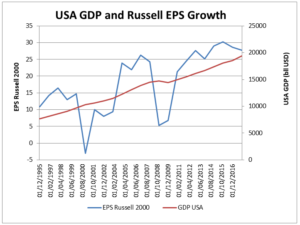 Russell 2000 is a good company sample of the USA’s economy, and its performance has been historically very close to the evolution of the GDP in the USA, as Chart 5 shows. Increase the GDP growth from year 2018 to 2027 by 1.2% growth and maintain terminal growth without changes compared to our baseline estimation. 600 · Although this scenario is more realistic, it still expects the highest positive impact of tax reform in GDP growth for the next ten years. o Increase of the baseline GDP growth from year 2018 to 2027 by 0.7%. o EPS of small caps growing 1.5% above the economy for 10 years. o Russell 2000 EPS up front increase of 135% based on a significant part of the 30% of companies which are in losses to get in profits. This last assumption is the hardest to admit. According to our calculation, there is a probability of 94% for the fair value of Russell 2000 to be below the current prices and 50% to obtain a return of 64% or higher, holding a short position in the index. Is Russell 2000 overvalued? We concluded that neither tax reform, not infrastructure investments plans nor protectionism can justify the extremely high valuations of Russell 2000. We estimate the currents levels are discounting a huge increase in EPS especially of the 30% of the index companies that today are not yet generating profits. Even assuming an increase of 135% of EPS of the index, it is still necessary to suppose other previously mentioned optimistic hypothesis to raise the fair value to the level of the current prices. As we are pretty sure that the fair value of Russell 2000 is below the current level, we can account with a good safety margin and say that Russell 2000 is a good investment opportunity to hold short position.